Julia is a musician; she has a successful Husband who loves her, and a beautiful three-year-old daughter who she dotes over. Life is pretty much perfect. The book starts with Julia buying a book of Gypsy Music whilst on a trip to Rome. Within its pages she finds an original piece of music by an unknown composer. Reading the music and playing it in her head Julia finds it complicated but beautiful. When Julia arrives home she plays the piece for the first time she waits till her three year old daughter Lily is playing quietly by herself, before taking out her violin and playing the piece. As she reaches the end of the piece her daughter comes running into the room covered in blood and holding a gardening fork. From that point on Julia’s life changes; the relationship with her family is affected by her thoughts and at the centre of it all that piece of music: Incendio. In Julia’s attempts to discover the origins of the music another story unfolds and the reader is transported to 1930’s Italy where a young musician, Lorenzo, is given his grandfathers violin and asked to take part in a duet competition with a young lady he has never met before. They are from different backgrounds and would never have met if it wasn’t for the music, but there blooming relationship has one major problem. Lorenzo and his family are Jewish and the Italian Fascists are beginning to act like their German allies and alienate the Jews. The young lady and her family try to warn Lorenzo’s family of the change in attitudes towards the Jewish community and convince them to escape before they are interned and transported to Poland with the rest of the Jews caught up in the horrors of Hitler and Mussolini’s reign. The 2 stories play out through the book. Lorenzo experiences in Europe during the 1930’s and 1940’s. Julia’s fight to prove her own sanity in America in the 21st Century. Eventually the two stories inevitably come together in a spine tingling conclusion to a story that, at times, made the hair on my arms stand up. 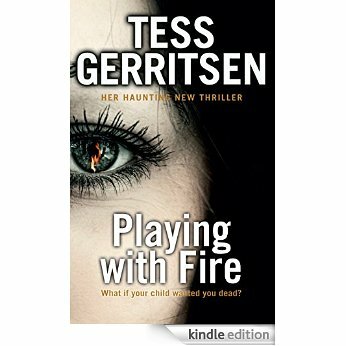 It is very hard to do this book justice without giving away too much of the plot. As a rule I usually am happy to comment on anything that happens in the first half of a book but nothing in the second, to avoid the dreaded spoilers. I could happily write about this book all day but that would just ruin it for everybody else, and everybody should read this. Whilst I was reading the book I had in my head the haunting violin piece from the film Shindler’s List. My daughter is a good violinist and I have seen her reduce people to tears playing that piece, and there is the obvious connection between the film and this story. 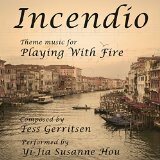 Then I discovered that Tess Gerritsen has composed a piece of music, Incendio, and had it recorded by one of the top violinists in the world. I had it playing whilst I wrote this blog. Just as it is described in the book it is a beautifully haunting waltz with a tumultuous finale. So I guess this is not only a book review but in a way my first music review. From an early age I have been reading, in fact you would do well to catch me without a book in reach. For years it was paperbacks, often second hand, as I got a bit older I started to treat myself to hardbacks so as I could read my favourite authors as soon as they were published. Now it’s all about the download, I have dozens of books on my Kindle and a few on my iPad from the Apple Store. It is this new download age that has got me asking questions. As an avid reader I spend a lot of time browsing bookshelves, whether they are in indie bookshops, Supermarkets, or the big chains such as Waterstones. Why am I not finding print books on the shelves I know are available online? At first I thought it might be a geographic thing. Some of the writers I’ve found online are from other country’s and maybe they haven’t found a market in the UK. Then I started finding really good UK authors I’d never heard of. Mari Hannah is a writer based in the northeast, she has written the best Police procedural thrillers I have ever read. Can I find her books on the shelves in the Midlands?Only in the biggest of the big bookshops, and only if I had already heard of her and knew where to look. There are more big displays for the latest John Grisham or Stephen King, in fact a recent trip to my local Waterstones found no UK writers books on their main display table. So maybe it is a more localised geographical issue. Maybe you have to be a really local author to get into your local shops. No, there is another excellent writer Angela Marsons who is hot on Mari’s heels as, in my opinion, the top Police Procedural writer at the moment. She sets her books in my local town in the Black Country, she lives and works close to the same area, the only place I have ever seen her books are on Amazon. She even mentions one big supermarket in her books, they have a big book section, I look through it every Sunday when I go shopping. Have I ever seen one of her books in there? No. So why are the bookshops not carrying these books. Is it because it’s easy to sell the big names?, or maybe the publishers are not out there pushing them enough. I know the writers are tireless in the promotion of their own books. There is hardly a week go by when they are not at a literary festival. Twitter is awash with them retweeting reviews, all online. I know the next generations first port of call for most shopping these days, especially books, is Amazon. They are missing out on touring around bookshops reading the backs and inside the cover. They are missing the adventure of popping into a shop to find something to read and losing a couple of hours of their lives as they get carried away browsing the shelves. Don’t get me wrong I love Amazon, I like the way it gives me suggestions based on what I’ve previously purchased, but it’s not as good as the conversations I have with the people who work in bookshops. I know I have found some fantastic writers, who’ve given me some fantastic stories and characters, but I wonder how many other people have missed out by just not living in the right part of the country.